Delightful Designs by Danielle: Magical Monday - An Easter Basket! Magical Monday - An Easter Basket! Good Monday Morning my friends! Welcome to my last Magical Monday with 'There's Magic in the Air with Paper Cupcakes'. My DT term is done and I enjoyed every minute of it with a fabulous group of ladies! They're also saying goodbye to Patti J - it has been such a pleasure working with this talented group of ladies! Our lovely Sue set the challenge this week with this super sweet 'Eggs-traordinary Find' - isn't this bunny the sweetest! She has asked us to make an Easter basket incorporating this image onto the project. I used this wonderful design I found over on my friend Christine's blog. I coloured the bunny & egg with very subtle shades of copics (it looks better IRL) and with my new MS grass punch I stuck it round the oval shape and added stickles for some sparkle! The paper is from BG Porcelain. I used another MS border punch (Daisy?) to create this pretty handle and added a gorgeous prima flower to the top. A gree ribbon tied to the side adds some finishing detail to the basket. It's an incredibly simple basket to make and have to say I'm so happy with the result. I hope you're able to pop over to TMITA and check out all the other DT's creations - they're gorgeous! And that maybe you can find the time to join in with the challenge this week too - Nina has another fab prize up for grabs! Well, that's all for today folks! Thank you so much for stopping by and coming for a visit! I always love to see you here - I hope you enjoyed my little Easter basket. I really hope I can get some more crafty time in this week - these last couple of weeks has been a little slow on the blogging side so I do apologise for that! Thanks for any comments you may leave - they are appreciated so much more than you could know. I would also like to thank my beautiful blogging friends, Linda & Sue for passing on this fabulous award to me - again, thanks for thinking of me and it is truly appreciated. I realise I also haven't mentioned my recent blog candy wins! 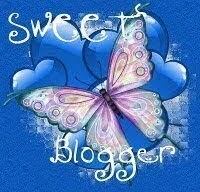 I want to thank Mandy for winning hers last Sunday and also Jodie from Oz for winning her Magnolia Down Under blog hop candy! I was also a runner-up with Norma's candy and won a sweet Mukmuk Olympic mascot keychain (my son has already claimed that prize from me, LOL)!! So, I have been incredibly lucky recently - maybe I should go and buy a lottery ticket!!! Also, my class on Saturday at Heather's was a great success - I had such a blast with the ladies and they made fantastic cards using the cuttlebug resist technique! OK, now I have to apologise for the long post, LOL! Enjoy your day everyone! Wow..Danielle...you did a fantastic Easter basket here! I hope you made 3 of those! It is wonderful to see your take on the basket! I love that MS punch for the arch! Adorable little image too! Congratulations on your award! Very deserved! What a super cute basket!The eggs look yummy too! Yum love what you have done, an yum yum love those cream eggs. Absolutely gorgeous basket. Just love the handle. Very cute image. This is a gorgeous Easter project, The basket is fantastic. I love the punched borders on the handle and the image is fantastic. The choccie eggs look delish. oooh what a gorgeous little basket Danielle and that image is a cutie!!! Oh Danielle this is such an adorable Easter basket!The bunny is so cute! Congrats on your award and all your winnings...and YES get a lottery ticket girl!!! We would like to do an interview with you about your blog for Blog Interviewer. We'd like to give you the opportunity to give us some insight on the "person behind the blog." Yes, we are going to miss you. This is an adorable Easter basket. Congratulations on your awards. Your basket is gorgeous Danielle, love the shape. Have enjoyed being part of the team for this month. Ah Danielle it won't be the same without you and the beautiful projects you design every week. Your Easter basket is lovely - I love how you decorated with this sweet image. Good luck to you in all you do, will see you around the blogs for sure. Happy Easter!! Welcome to Paper Inspirations by Danielle. I hope you feel inspired by my card creations and my love of paper crafting! Please leave a comment - I'd love to hear from you! Thanks for stopping by and please come back again soon! Please feel free to contact me should you wish to receive information on children's birthday parties, place a card order, buy a card you've seen posted up here or are interested in taking classes. All content, including text, photographs and design work (unless otherwise stated) is © Danielle Lord. My original artwork is for your personal inspiration only and may not be copied for publication or contests. Please feel free though to case any project you see - a link back to my work would be hugely appreciated! Thank you! Where I like to spend my money! Winter Wonderland - A sketch with Santa! Magical Monday - Bunny Cupcake! Tilda - A Birthday Card! An Edwin card for 3 challenges! Magical Monday - Green & Gold! Just Magnolia Challenge - A Tent Card! Tilda with Kitty - A card for 2 challenges! Magical Monday - A sketch and lots of pink! TAYLORED EXPRESSIONS 10TH BIRTHDAY CELEBRATION! Slinky ♥ Tart | (Smexy) art by T.